Games like Angry Birds and Plants vs. Zombies captured iPhone users' attention by providing fun, addictive gaming that takes advantage of the iOS devices’ mobility, touch screen technology, and portability. Although hundreds of games make their debut each month, few are exceptional enough to join the cannon of great, classic iPhone games. Developer Playfirst’s new puzzle action game Egg vs. Chicken may well be the latest addition to this elite group. The game utilizes fun cartoonish graphics and a unique combination of match-three and tower-defense gameplay to create an addictive gaming experience that, while in need of more levels, manages to stand out from the countless other games that hit the App Store each month. Don't call them "Easter" eggs: these eggs are ready for battle. To win the game, players must defend their pen full of eggs from the hoards of chickens trying to get at them. 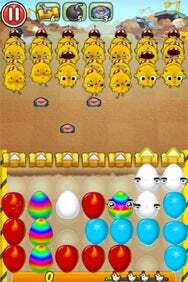 You must slide matching-colored eggs to the launch area at the front of their pen to make groups of three, and then flick to shoot the eggs towards the chickens, making them disappear. This combination of match-three and action gaming is a new twist on the puzzle genre. The pen gets a bit crowded at times, as new eggs pop up to replace the ones you’ve shot and spare eggs are also collectible outside the pen where the chickens are invading. To make room for eggs of the same color, tap an odd-colored egg to delete it. Meanwhile, after you've collected your eggs and are ready to go on the offensive, there are different strategies to employ. Different chickens have different weaknesses; for instance, the yellow eggs electrocute chickens with metal helmets, but it takes three or four plain white eggs to ward off the chapeau-wearing birds. Additionally, grouping more eggs together makes for a bigger firing squad, and ultimately earns you more points. The graphics in Egg vs. Chicken are fun and cartoonish. The egg/chicken battles take place in several different scenes like deserts and fields. The game is played with the phone or iPod in its upright position, rather than widescreen; this gives the necessary extra space for players to see the offending birds approaching, and the game never felt cramped or cluttered. The screen is composed mostly of the action of the game, with only your weapon choices at the top of the screen, your score, and a tiny green bar that tracks your progress, so you know how many more fleets of feathered foes you have to defeat before the round ends. Based on how well you complete each level, you’re awarded a star score. Three stars indicate you performed perfectly, while one or two mark that you completed the level. The developer does a fine job of providing incentive for players to go back and try to collect more stars, though, in that you can use them as currency to buy defenses and special skills. You can upgrade your eggs so they’ll pack more of a punch when they strike, or purchase bombs and land mines to buy you time to organize your eggs when birds attack. The puzzle of maneuvering the eggs is enjoyable, and my sole complaint about the game is that it needs more levels to provide the playability that keeps me coming back for more. It took me no time at all to earn enough stars to buy out the store, and after only a few days of playing Egg vs. Chicken, I succeeded in completing and gaining three stars in the thirty six levels the game debuted with. I’m really rooting for Egg vs. Chicken, and hope that the next update comes soon and brings more, harder levels; I can’t say I’ll keep the app around for very long if it doesn’t step up the replay value.